We’d love your help. Let us know what’s wrong with this preview of Daughter of Twin Oaks by Lauraine Snelling. Seeking to fulfill the promise she made to her dying father, eighteen-year-old Jesselynn Highwood determines to take her little brother and the family's Thoroughbreds from Twin Oaks plantation in Kentucky to her uncle's farm in Missouri to protect them from the ravages of the War between the States. They embark on a perilous journey, riding at night, hiding during the day, Seeking to fulfill the promise she made to her dying father, eighteen-year-old Jesselynn Highwood determines to take her little brother and the family's Thoroughbreds from Twin Oaks plantation in Kentucky to her uncle's farm in Missouri to protect them from the ravages of the War between the States. To ask other readers questions about Daughter of Twin Oaks, please sign up. This book had good characterization. It felt real and I loved following the main character Jesselynn on her adventure from her home in Kentucky to Missouri during the civil war. Just when I felt the book was picking up pace and getting really interesting, I found myself on the last page. Since I was using my kindle app to read this I thought maybe my app messed up and it was stuck, but no... the book ends and leaves you hanging. I was like "What?!? No ending!" I don't like being forced to have t This book had good characterization. It felt real and I loved following the main character Jesselynn on her adventure from her home in Kentucky to Missouri during the civil war. Just when I felt the book was picking up pace and getting really interesting, I found myself on the last page. Since I was using my kindle app to read this I thought maybe my app messed up and it was stuck, but no... the book ends and leaves you hanging. I was like "What?!? No ending!" I don't like being forced to have to read the next book. I want to come to an end and then decide if I go on to the next book in the series. The next book in the series is called Confederate Sisters, if the book doesn't being with Jesselynn in the first chapter, I'll probably won't finish reading it as I don't want to start out with one of the sisters as the main character when I haven't finished finding out about Jesselynn and her journey isn't over. Until the end, I found this to be a captivating story. The characters were realistic, it had great Civil War depictions and the heroine was a decent person and could stand on her own two feet. Some of the parts I found a little unbelievable or predictable, but nothing crazy. Then I got to the end. Oh, wait. There was no ending. The book stopped. Two things that drive me to not read an author again are ridiculous grammar/spelling issues and forcing a reader to get another book to finish a story. I Until the end, I found this to be a captivating story. The characters were realistic, it had great Civil War depictions and the heroine was a decent person and could stand on her own two feet. Some of the parts I found a little unbelievable or predictable, but nothing crazy. Then I got to the end. Oh, wait. There was no ending. The book stopped. Two things that drive me to not read an author again are ridiculous grammar/spelling issues and forcing a reader to get another book to finish a story. I enjoy series books but don't want to have to purchase another book to know how the story ends. Individual books should be stand alone or at least it should be clearly indicated you have to buy subsequent books in the series to see how things end. The genre of this book is historical fiction and it is a well written Civil War dram that actually describes the lives of several daughters of the Twin Oaks Plantation. Twin Oaks is well known for their excellent horses - BEFORE the war and before the Armies conscripted horses for their uses. Daughter Jesselynn is left in charge of the few quality horses left and charged with the task of moving them to Springfield. MO TO HER uncle Hiram's Plantation for help in saving the bloodline. Figuring out The genre of this book is historical fiction and it is a well written Civil War dram that actually describes the lives of several daughters of the Twin Oaks Plantation. Twin Oaks is well known for their excellent horses - BEFORE the war and before the Armies conscripted horses for their uses. Daughter Jesselynn is left in charge of the few quality horses left and charged with the task of moving them to Springfield. MO TO HER uncle Hiram's Plantation for help in saving the bloodline. Figuring out the logistics of how a young woman in the mid- nineteenth century could safely travel with a number of blacks AND several high quality horses has Jesselynn flummoxed until she decides to pose as a young man. She does not have a very curvy figure, so she believes that if she cuts and dies her hair that will will be a sufficient disguise. She also shortens he name to Jesse. Another huge liability Jesse has in taking this trip is her two year old brother Thaddy, but she will not consider leaving him behind for enemies to get ahold of. The trip to MO is perilous yet rewarding. Jesse ends up with the added responsibility of more mouths to feed along the way but she and her people manage nicely. Unfortunately they find that her Uncle Hiram is deceased when they reach Springfield and that the farm had been burned down. NOW WHAT WILL JESSE DO? As Jesse's story is told, the story of her sisters, Louisa and Carrie Mae is interwoven. Instead of been titled daughter of Twin Oaks, a more appropriate title would have been. DAUGHTERS OF TWIN OAKS as all of the girls are covered in the story - plus a Confederate soldier son! While I did like most of this book I thought that it ended rather abruptly. Now that I am starting the next book in the series I see that it takes off at exactly the point that book one left off. I just felt that Ms Snelling went through so much detail everywhere else in the book that the ending was as if she had written a long novel and simply cut it into section. I REALLY wanted to love this book, but it was so boring and very hard to read when the characters spoke southern. I love reading books that focus on the civil war, but I was just not into this story at all. It was a type of story that I knew what would happen next and being right. I really enjoyed the book. The tragedies of the Civil War is difficult to visualize but it is part of our country's history. This story showed you how some of the most prosperous people had to adapt. Good book. Obviously trying to set up for next in the series. Disappointing that there were no conclusions to any of the story lines. If there had been a better conclusion would have rated it better. You enjoy each of the characters so you want to keep reading. The way this book ended, it could have ended at any given chapter. It's as if the author decided to just stop writing. This is author manipulation at its best! This book is aptly named Daughter of Twin Oaks as it goes to narrate the arduous journey of Jesselyn, the oldest Highwood daughter, from her home Twin Oaks to Missouri in search of a safer ground in the Civil war-torn America. The Highwoods plantation was thriving before war. Joshua Highwood never had to worry over feeding his big family or his slaves, whom he dreamed of freeing as soon as the opportunity arrived. But the wretched war changed everything for them. Joshua went to war, his wife Miri This book is aptly named Daughter of Twin Oaks as it goes to narrate the arduous journey of Jesselyn, the oldest Highwood daughter, from her home Twin Oaks to Missouri in search of a safer ground in the Civil war-torn America. The Highwoods plantation was thriving before war. Joshua Highwood never had to worry over feeding his big family or his slaves, whom he dreamed of freeing as soon as the opportunity arrived. But the wretched war changed everything for them. Joshua went to war, his wife Miriam died giving birth to their last child, Thaddeus or Thaddy. His oldest son Adam also died in war, the next Zachary gone missing. Joshua came home 2 yrs. later to die of his wounds. Jesselyn, next to Zach, was only 18 at that time. She had to grow up so fast that it might've spun my own head. She had to take the responsibly of not only a plantation full of slaves but also of 2 yrs. old Thaddy, and her sisters Louisa and Carrie Mae. She sends Louisa and Carrie Mae to Richmond to live with their maternal aunt for safety purposes. She then takes measures to free her slaves. Afterwards, Jesselyn plans on journeying because she'd promised her father one thing before his passing; to take their prized thoroughbreds to her uncle Hiram's to hide away from the soldiers. After all, Highwoods have always been known for their stud farm and splendid horses. They needed to hold onto some hope; that once Zach returned, and the war ended, they can start over rebuilding. What Jesselyn, who masquerades as a boy to save herself from danger in this tumultuous time, in her inexperience didn't even begin to comprehend how difficult it would be for her to cross one side of America to the other. With only 4 freed slaves, whom she considered more family than anything else, to take care of her and Thaddy, Jesselyn headed out and on the way, she saw and experienced so much negativity that it changed her forever. The deaths, misery and sufferings of war everywhere even shook her faith in God. On the way, she takes on more people in her little band of misfits, not knowing how can she feed so many mouths. Yet her only beacon of hope was uncle Hiram's farm, where she planned to stay put for Winter, then return to Twin Oaks in Spring. Simultaneously, Louisa and Carrie Mae's stories are also told. Even though, the girly girl Carrie Mae has already found herself a suitor and is getting married soon, Louisa wants to be more helpful. She has the need and drive to become a healer. And though she lacked the experience in becoming a doctor or a trained nurse, Louisa finds a way to contribute. She's now working as a volunteer in the nearest hospital, fabricating her marital status since unmarried women are totally discouraged from even going there, let alone help. But no matter, both sisters are very worried over Twin Oaks and their siblings they miss so much. Letters don't arrive that easily, so they learn quite late about Jesselyn's journey. Even in the midst of war, loves comes to Louisa, but she doesn't get her happy ending. I was so hoping for her and Gilbert to be together that it broke my heart into pieces. I really wish the the news she got from Zachary, who turned out to be alive by some miracle, isn't true. Jesselyn also finds someone along the way. Barbanas was a soldier she saved from near death. Even though Jesselyn was still masquerading as a boy, he knew she wasn't. The attraction was instant. Unfortunately, he had to leave her when a missive arrives from home. There is that unspoken promise but will they ever make it through? It seems that both Highwood sisters are fated to be heartbroken, though thankfully, Carrie Mae gets to marry her sweetheart, Jonathan. There is no conventional hero or heroine in this story because Daughter of Twin Oaks is as much Jesselyn's story as Louisa and Carrie Mae's. Even Zachary's, Meshach's and Ophelia's. While reading, I couldn't help notice that most of the male protagonists (all the love interests of the sisters' and Zachary himself) of this story aren't whole and hearty. Much like the country itself, they are ravaged by war, missing one limb or the other. I wish I could say there was light at the end of the tunnel for Jesselyn or Louisa. While Louisa devotes herself more in the healing process of Zachary and a few other soldiers she was responsible for, Jesselyn learns some very heartbreaking news, when, after 2 months of grueling journey, they finally arrive in Missouri. For one, Uncle Hiram's farm no longer existed, he being one of the earliest casualties. Then, to top it off, there's bad news about Twin Oaks. I was simply heartbroken yet once again at the despair vibrating off of Jesselyn. It was just... inexplicable. As Jesselyn would think over and over again, would this war ever end? Would they make it through? Most importantly, would the siblings ever get to see each-other again? But our Jesse isn't the type to give up, so she plans to forge on, come what may. She'll find a way, think of something. When the good news of Zachary reaches her, her hopes are revived once again. Maybe all is not lost for Twin Oaks as their horses are now in a safer place too. She only hoped she can hold on until Spring. Until all of them can return to Twin Oaks. 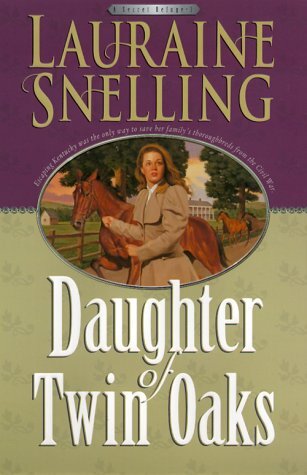 Daughter of Twin Oaks, book 1 in A Secret Refuge series, was my very first book by Lauraine Snelling and it won't be my last. It was told in third person POVs, from both Louisa and Jesselyn's; done very well too. I must admit it's a winner because I've already come to love this saga of the Highwood family so far. The saga continues in book 2, Sisters of the Confederacy, which I can't wait to dig in. I need to know where the siblings are headed to. This story is also what you'd call a clean cut, Christian-themed romance so don't expect any steamy moments. I'm crossing out 0.5 because of the typos, probably from the scan that was done to prepare the ebook edition. I maybe wrong but I wasn't expecting those. This is my only complaint, so 4 stars and recommended. Daughter of Twin Oaks by Lauraine Snelling is the first book in her Secret Refuge Series that I enjoyed. It is at the time of the Civil War and Jesselynn is the daughter left to run the family's tobacco plantation called Twin Oaks. Her brother is off at war, her parents are both dead and her two sisters are living with an Aunt in Virginia. Twin Oakes is in Kentucky and she is trying to keep her few horses from being taken for use in the war. After giving all her slaves their freedom, they decide Daughter of Twin Oaks by Lauraine Snelling is the first book in her Secret Refuge Series that I enjoyed. It is at the time of the Civil War and Jesselynn is the daughter left to run the family's tobacco plantation called Twin Oaks. Her brother is off at war, her parents are both dead and her two sisters are living with an Aunt in Virginia. Twin Oakes is in Kentucky and she is trying to keep her few horses from being taken for use in the war. After giving all her slaves their freedom, they decide to stay and keep working at Twin Oaks anyhow. She proceeds to take the horses to her Uncle's farm in Missouri until the war is over, thinking they will be safe there. She takes a few of her former slaves along, a wagon, a mule and her little brother Thaddeus. Dressing like man, she and her group start their trek, trying to keep from soldiers seeing them along the way. The other story line was about Jesselynn's sister in Virginia who volunteered at the wounded soldiers hospital. The faith of the daughters is challenged by all the bad things that happen. This book is full of action and adventure. I was beginning to wonder if they ever would make it. It is a quick read and left me wanting more. Interesting characters and it made me more aware of the obstacles families in the south had to deal with during the Civil War. I look forward to reading the next book in this series. I've been slowly dragging along in this book over the last few days and I finally decided to call it quits. A good book draws me in. It's world becomes my world to the point where I almost forget I'm even reading. This book just didn't do it for me. The story line was a bit obvious and awkward. I didn't feel like the relationships were authentic. The characters and story line were not developed well. Instead of leading the reader along so they could see who everyone is and how they fit in to the I've been slowly dragging along in this book over the last few days and I finally decided to call it quits. A good book draws me in. It's world becomes my world to the point where I almost forget I'm even reading. This book just didn't do it for me. Usually if I don't like I book I'll keep reading it out of stubbornness, if not a hint of curiosity as to how things will turn out. It's very rare that I leave a book hanging. In this case, I just don't care enough to finish it. I read this book a while back and loved it then. So when I saw that it was getting reprinted, I knew I had to get them to add to my library of books. After finishing this first book in the Secret Refuge series, it still remains one of my favorite historicals of all time. I am a BIG lover of history and, more specifically, the War Between the States, and for such a controversy war, Lauraine handles it well. While both the main characters in Daughter of Twin Oaks -- Jesselynn and Louisa -- have th I read this book a while back and loved it then. So when I saw that it was getting reprinted, I knew I had to get them to add to my library of books. After finishing this first book in the Secret Refuge series, it still remains one of my favorite historicals of all time. I am a BIG lover of history and, more specifically, the War Between the States, and for such a controversy war, Lauraine handles it well. While both the main characters in Daughter of Twin Oaks -- Jesselynn and Louisa -- have their father and brothers fighting for the Confederacy, Lauraine gives the gritty facts of that war between brothers and shows how, for many people, it didn't matter what uniform they wore. Jesselynn tries to keep her pure-breed horses out of the hands of both armies--North and South--and Louisa is desperate to give aid to any wounded man in uniform--blue or gray. As I said, after rereading this book, it still remains my favorite book on the War Between the States. I am already diving into the next book in the series, Sisters of the Confederacy! Enjoyed the book on the whole. The disappointment came at the end. There was no end! Nothing is resolved in the first book. It just stops and leaves you hanging. As much as I wanted to like this book I just could not. There were some good parts but it seem to me that the went on and on with no ending. This book was good from the first page on. I can't wait to read the next one!! I love finding out what happens with my favorite characters from the story! Disappointed at the ending oh no it didn't end!!! Great book until the ending which just leaves you hanging. I like multiple books but they should not be dependent on other books. I could not put this book down. When I turned the last page, I was disappointed that there wasn't another chapter. I would have loved to rate this five stars. But the cave scene with the scorpions was too much. If anyone had so much go wrong in the time span Jessie and her parade has had gone wrong, they would be mentally gone. The tragedies never stop. Enough already and I haven't even finished the book. All this time and her sisters and brother, while not sipping tea in Virginia, have the life of relative ease. Three weeks, start with her pa dying, she has to sneak out of her plantation at night, more and more I would have loved to rate this five stars. But the cave scene with the scorpions was too much. Three weeks, start with her pa dying, she has to sneak out of her plantation at night, more and more go wrong on the road. Then comes the unreal parts, the group gets very little sleep after not sleeping but a couple hours for most nights, the woman slave that cares for her young toddler brother are the only two that sleep a good night's sleep each and every night for the first week. They find a dead slave woman who died in childbirth in a dried river bed, if I remember where, but that is not all, a child about two I think is crying there for his mommy. So they bury the woman, the newborn, and take the child. This child cries and cries then he gets sick, and Jessie don't know how to care for the boy. No herbs or honey or whiskey to heal him. But after a few days the sickness is not mentioned. Hmmmm. Then her enemy is in the same town as her. Then something else, I forgot. Then on a ferry one of her male slaves is swept off, into the Mississippi river. They don't know if he is alive or not. Then another night of gun fire. Then two older children show up. Their ma and pa were killed by soldiers that are not either side, ones that kill to kill. Oh ya, I remember a lame horse is found and taken by their group. The horse is real bad off. The rain causes more problems between these other tragedies. Now they find a cave, but it is taken by two soldiers, wait! One is dead and the other severely wounded! So she cleans the wound, with no medicine, no whisky, only a knife heated. The orphan girl told her how to do that. Then her main slave, comes back, with some meat, the only good that happens so far on the trip. But the wounded soldier has to have his leg amputated! Yep you read it, so they cut off the leg in front of the children and all. Of course she barfs at this point. So you think that is enough? Now we get to where I had to write this review. They all are finally sleeping. The first good night sleep since leaving the Twin Oaks. Then she wakens to screams! Yes same night as cuttin' leg off of soldier, and now they are plagued by scorpions! Too much tragedy and ridiculous! I have no idea what else will happen to her now group of more sick than well. Come on Lauraine, enough is enough. A book with this much tragedy shows you must have forgotten what you were writing. If anyone went through that much in three weeks they would be crazy! All this time her sisters and brother are pretty safe and life is going too well for them, considering third sister has more tragedy in three weeks than most civil war survivors did in their lifetime! Also in the book (about a quarter of the way in the book every other chapter talks about Jesse and their travels and ever other takes you back to the town of her younger sisters and their survival with their aunt.) Again because of the war Louisa has to say a few lies to be able to go and volunteer at the hospital where "ladies" aren't allowed. Seeing things they shouldn't see of the men coming in and needing treatment. But widowed ladies are allowed. So she lives a lie to be able to do what she feels her heart is telling her to do and making a difference in many of the men's lives and helping the doctors all she can. In the meantime happiness does come to her in forms she never would imagine. At the end of this book you WILL want to have book #2 on hand; as when it ends you want to read on to see about the various lives within this book. Will all the families get reunited? Or will the war continue beyond Spring when everyone is hoping it will end? I realy wanted to love this book. The cover is beautiful and the story sounded like my cup of tea.However, there was a lot of things I didn't like. The writing itself is entertaining but some things annoyed me while reading. The fact that none of the slaves at Twin Oaks wanted to be freed and that all in Jesslynn's home apeared content was to me at least unrealistic even if her father was a kind master. ( After being freed one slave miraculously now looked people in the eye! ) Even after she freed them she still made their choices for them! Argggh! And I am sorry to say I didn't care whether the horses where taken by the army or not. Also is it just me or are a lot of authors thinking that if they throw in a few little kids you have yourself an adventure? I am tired of single men/women having to look after kids not theirs ( sibling or otherwise) . What I did like was that she was no southern belle. She was a bit of a tom boy but at heart a true lady.Then the pov changed to a sister not even spoken of on the back cover. And I loved reading about her sister who was a nurse/helper. Louisa made me want to skip to get back to her story. Unfortunately she was not the main story being told . I truly wanted the best for Louisa. Because of Louisa I debated over a 3 or a 4. Louisa and her story was a 5 star rating, Jesselynn's brought it down for me. Also, the Author cheated on the ending. I hate cliff hanger endings. The point of a sequel is to know more about their lives not to find out if they succeed or not. This book is as historically accurate as I have seen about the early days of the Civil War. The trip from Kentucky to Missouri was maybe the best I've read that conveyed how broken our state was and how deep and violent the split was between families. From where I live in Raytown, a suburb of Kansas City, MO (the biggest Kansas City), there are over a dozen battle sites within a three hour drive. I've noticed that some readers seem to think the two sisters who went to Richmond were much better off This book is as historically accurate as I have seen about the early days of the Civil War. The trip from Kentucky to Missouri was maybe the best I've read that conveyed how broken our state was and how deep and violent the split was between families. I've noticed that some readers seem to think the two sisters who went to Richmond were much better off than Jessie. I suggest they read the history of the later sacking of Richmond. Richmond was a disaster that had just not happened yet in this story. I like the characters and hope they are able to leave Richmond before Grant drives through it. Grant may well have been a scholar, but in war he was certainly no gentleman. If his march to the Atlantic had been less brutal and destructive, Reconstruction would have taken much less time and there would have been less horribly crippled survivors by orders of magnitude. Most Americans today don't know that slavery was the spin that was used for justification for the war. The facts show that many plantation owners had already freed their slaves and they workked the plantation on a share the crop basis. Set in the time of the Civil War, the author writes such descriptions and dialog you could almost be right there. After the death of her parents, Jesselynn takes on the responsibility for her family. She sends her 2 younger sisters to live with an aunt in Richmond, while she tries to save the thoroughbred horses by taking them to her uncle. Traveling with her baby brother and a few of the freed slaves, she disguises herself as a teenage boy and heads out from Kentucky to Missouri. It's not easy h Set in the time of the Civil War, the author writes such descriptions and dialog you could almost be right there. After the death of her parents, Jesselynn takes on the responsibility for her family. She sends her 2 younger sisters to live with an aunt in Richmond, while she tries to save the thoroughbred horses by taking them to her uncle. Traveling with her baby brother and a few of the freed slaves, she disguises herself as a teenage boy and heads out from Kentucky to Missouri. It's not easy hiding from both the Confederate and Union armies who would take the horses, and also a former overseer who has threatened them all. There is a second storyline with her sister Louisa who works in the hospital in Richmond tending the Confederate wounded. This is the first in the series, and I'll have to read the next to see how they manage to keep safe and reach a place of freedom for all of them. Award-winning and bestselling author Lauraine Snelling has over 80 books published with sales of over 4.5 million. Her original dream was to write horse books for children. Today, she writes adult novels about real issues centered on forgiveness, loss, domestic violence and cancer in her inspirational contemporary women’s fiction titles and historical series, including the favorite, Blessing books Award-winning and bestselling author Lauraine Snelling has over 80 books published with sales of over 4.5 million. Her original dream was to write horse books for children. Today, she writes adult novels about real issues centered on forgiveness, loss, domestic violence and cancer in her inspirational contemporary women’s fiction titles and historical series, including the favorite, Blessing books about Ingeborg Bjorklund and family.